This image posted here courtesy of Fabian Pesikonis, the man behind the great blog "Carros de Combate" (fighting vehicles in spanish). Check out Fabian's blog for more photos. This tank is displayed at the base of a monument honoring the III Argentine Army Corps. I maybe wrong but this looks like a Sherman Ic "Firefly", hybrid variant (welded aft joined to a cast glacis). 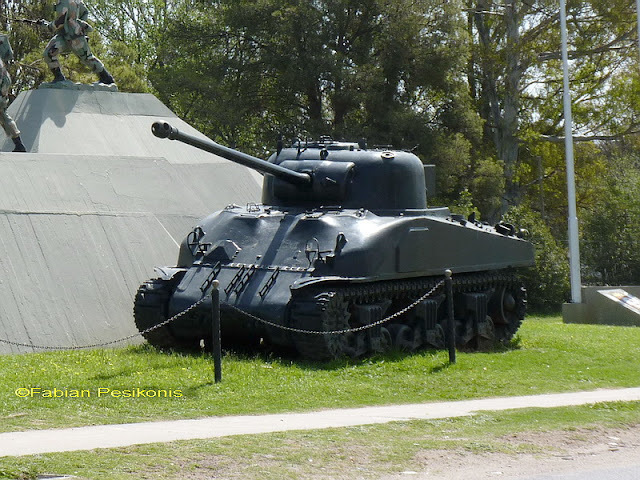 I can't be sure about the gun, because the Argentine Army modified con gusto the stock guns of these Sherman exports. This display is a couple of kilometers west of the city of Cordoba, Argentina and some 90 kilometers south of my hometown. I may have traveled past this site like a million times on my way to college. Never payed attention to it (maybe too focused on parties and girls by that time). Repotenciado - Conversions of British Sherman VC and IC Hybrid to include a diesel engine and a new armament suite, the 105 mm FTR L44/57 gun (an Argentine copy of the CN-105-57 Gun used on the AMX-13), a co-axial MAG-58 machine gun, and turret pintle mounted M2HB machine gun. Les dieron bastante uso, los dejaron hasta el 93 cuando los remplazaron con los TAM. This tank was built as an M4(75)VVSS Composite by Chrysler Corporation, Detroit Tank Arsenal, Warren Michigan in 1943. It was sent to Britain and converted to a Sherman Hybrid IC, Firefly in 1944/45. It was sold to Argentina in 1947/48. It still retains its 17 Pounder gun. It was not upgraded to a Repotenciado. The engine grill is not original to the M4 indicating a different engine was installed. Its original serial number is 44378. Its US Army Registration number is 30100612. There are two other M4 Shermans in Cordoba. If you want information on them contact me.